BEST FIGHTER FOR CANADA: Gripen: Sensible Swede? The Saab Gripen does not even seem possible in this day and age. A modern jet fighter built by a small nation with less than a third of Canada's population. Not only that, this small fighter has stolen sales away from the like of Dassault and Boeing. During the Cold War, Sweden practiced neutrality. Nevertheless, its close proximity to the then-Soviet Union made for an uncomfortable position. If the Soviet Union was to invade with its full military might, there would be little a small nation like Sweden could do about it. In order to make a foreign invasion as unattractive as possible, Swedish defence officials adopted a strategy of guerrilla war-type tactics. As such, much of Sweden's defense arsenal can operate from austere bases with a minimum of personnel. Amazingly, even supersonic jet fighters were expected to operate without a full airbase, publics roads would take the place of runways if need be. During the late 70s, Sweden needed an aircraft to replace its aging Draken and Viggen fighters. While foreign designs like the F-16 and Mirage 2000 were briefly considered, the Swedish government opted for a home-built fighter. This new fighter would be lightweight, single-engined, and capable of switching roles between air-superiority and strike mid-mission (swing role). 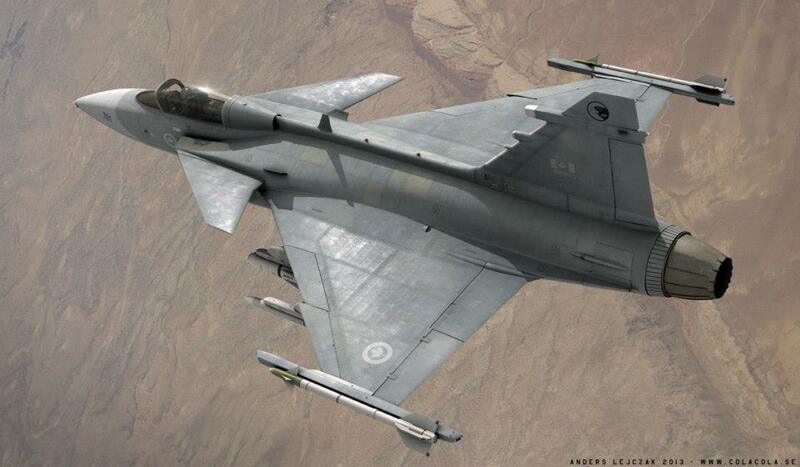 This new fighter was designated JAS 39 for Jakt (air-to-air), Attack (air-to-ground), and Spaning (reconnaissance). Despite early issues with the flight control software (FCS), the Saab Gripen has gone on to enjoy a stellar safety record. Development of the NATO compatible and export-friendly JAS 39C and D models resulted in export sales to the Thailand, South Africa, and the UK. Lease deals have made with Hungary and the Czech Republic. The newest version of the Gripen, the JAS 39E will soon see service with both the Swedish and Brazilian Air Forces. The aircraft was selected by Switzerland as well, but a referendum cancelled the sale. In 2011, the Gripen saw action over Libya when Sweden participated alongside NATO forces. Swedish Gripen performed over 37% of Operation: Unified Protector's recconnasaince reports, surpassing 1,000 hours of flight time. 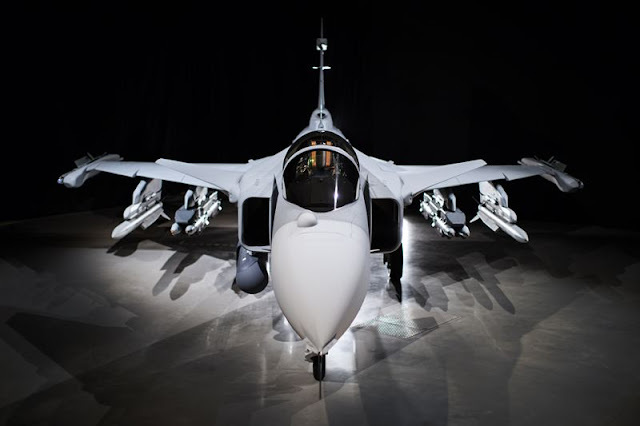 Saab markets the Gripen as the "smart fighter". It promises similar technology and performance as other strike fighters, but at a reduced cost to procure and operate. This is possible thanks to its smaller size (smaller aircraft burn less fuel) and a keen focus on ease-of-maintenance. All major components are easily swapped out. 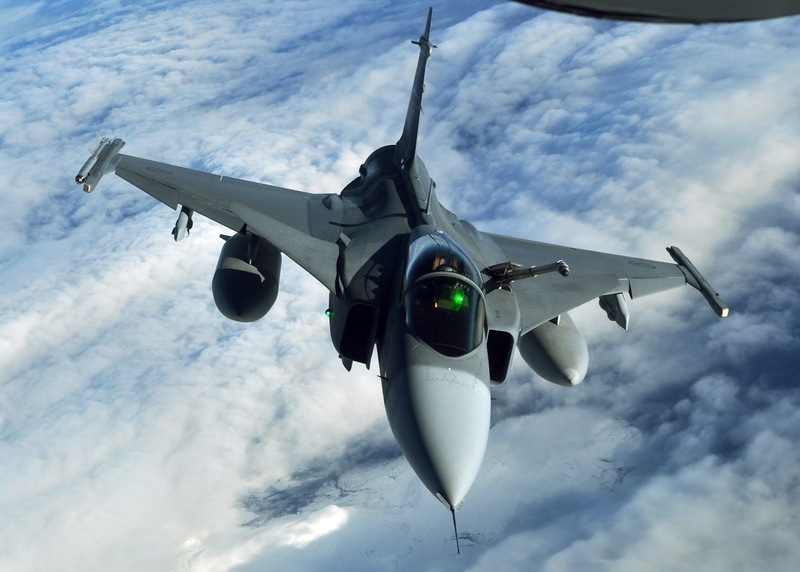 The Gripen can be refueled and rearmed at an improvised road base in under ten minutes. 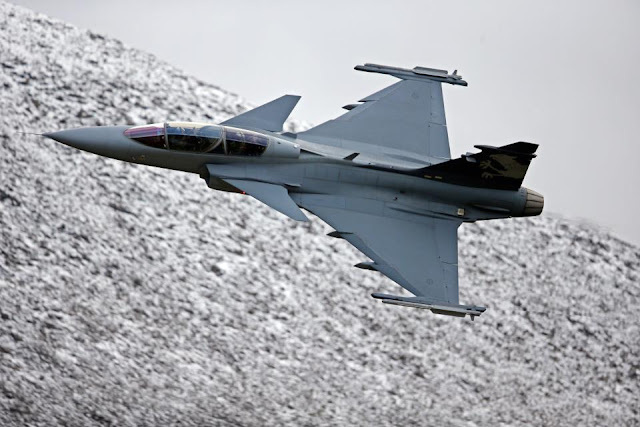 The latest version of the Gripen, the JAS 39E (aka: Gripen NG), has undergone several changes to keep it competitive. Larger wings, fuel tanks, and relocated landing gear allow it to carry 40% more fuel than older models. The GE F404-derived Volvo RM12 turbofan has been replaced with the 22% more powerful GE F414. Two more hardpoints allow for 13% more payload. Despite the extra power and fuel, empty weight has gone up a mere 3%. The Gripen NG's avionics and sensor packages have been upgraded as well. Like the Typhoon and others, the JAS 39E can be considered a "4++ generation" fighter. A swiveling Selex Raven AESA radar and Skyward G IRST provide "fifth generation" detection and tracking capabilities. Defensive systems are enhanced with expendable decoys and an electronic warfare suite that utilizes Gallium Nitride (GaN), and industry first. 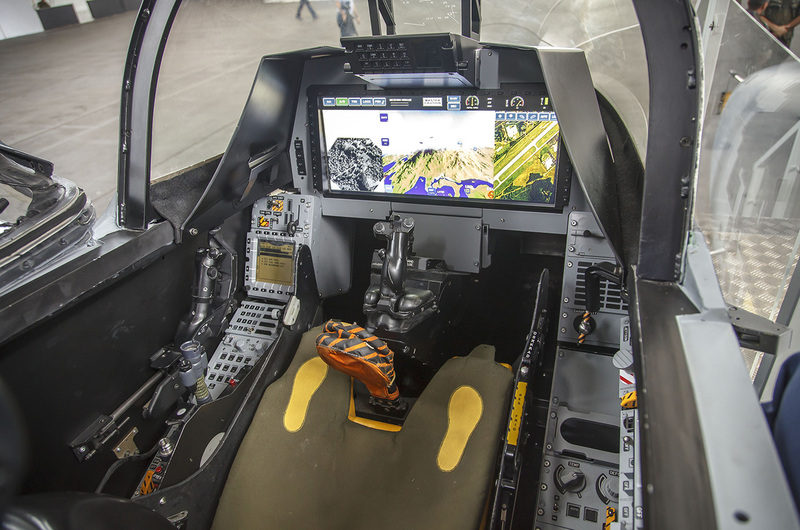 Its modernized cockpit features a "widescreen" touch display and the same HMD as offered on the Typhoon. Despite its relatively small single engine, the Gripen matches or exceeds the performance of much heavier and powerful aircraft. This is thanks to simple physics: A smaller aircraft weighs less and presents less drag, requiring less force to move it. This allows the Gripen to just about match the aeronautical performance of Typhoon, despite getting by on about half the thrust. A top speed of mach 2, capable of pulling blackout-inducing 9g turns, and a service ceiling of 50,000 feet lets the Gripen compete with the big boys. Unlike the bigger fighters, the Gripen is capable of STOL (short take-off and landing) operations. At maximum take-off weight, the Gripen requires less than 2,000 feet of runway. This is without benefit of a tailhook or brake chute. To put that in perspective, the F-35A Lightning II requires four times that distance. Earlier model Gripens did have issues with range. 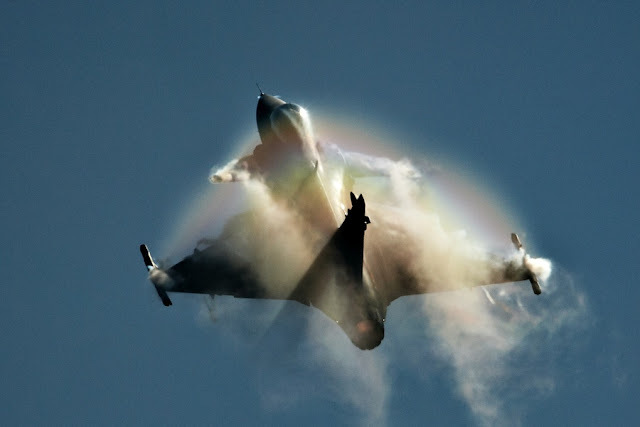 Thanks to its extra fuel capacity, the JAS 39E corrects this. With external tanks, the Gripen NG has a range of over 4,000km with a combat radius of 1,300km. This puts it in the same category of the much larger F/A-18E/F Super Hornet. With an eye on export sales, Saab has been very keen on ensuring the Gripen works with whatever weapon the end-user prefers. 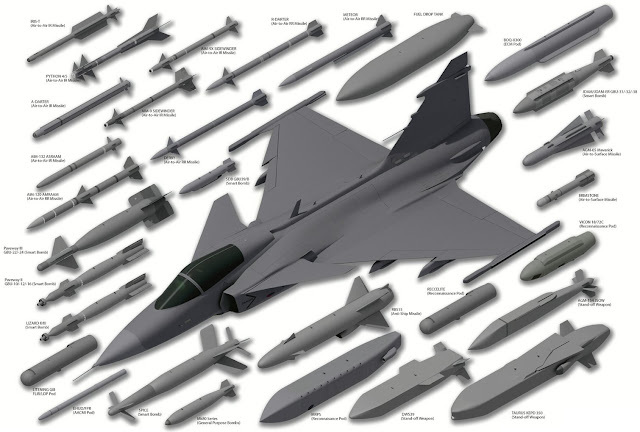 The Gripen cleared for commonly used missiles like the American sourced AMRAAM and Sidewinder, European sourced IRIS-T, ASRAAM, and Meteor. Not only that, but more obscure weapons like the Israeli-sourced Python and Derby, as well as the Brazilian A-Darter. For strike missions, the Gripen utilizes larger "stand-off" missiles like the KEPD-350 right down to smaller missiles like the venerable AGM-65 Maverick and the diminutive Brimstone. Also supported are various "dumb" and "smart" bombs like the Paveway and JDAM. Like the Typhoon, the Gripen comes armed with a 27mm Mauser MK-27 revolver cannon. When compared to its heavier competitors, the Gripen cannot compete when it comes to payload. It can only carry 13,200 pounds worth of ordinance. This is rather less than the others, which hold anywhere from 16,500 pounds (Typhoon) up over 20,000 pounds (Rafale). The Gripen E does come close to matching the current CF-18 (13,700 lbs) however. While Canadians may like to pride ourselves on a military in the same league as our NATO partners, fiscal reality paints a more dismal picture. Defence spending is simply not a priority. While NATO recommends spending 2% of GDP on defence, Canada gets by on half that. While the Gripen may not be getting the same press as the F-35 and Super Hornet, it could very well be the "dark horse" of the candidates. Like the Typhoon, the Gripen certainly looks good on paper. Unlike the Typhoon, the Gripen has a reputation for reliability, easy maintenance, and low costs. The Gripen also has some unexpected political pull in Canada. 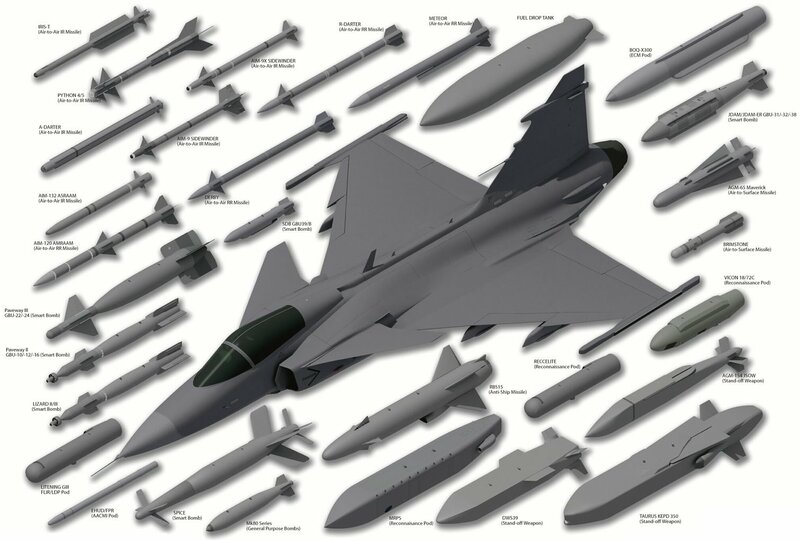 Unlike the all-French Rafale, Saab was not afraid to outsource parts of the Gripen. Many of those parts are made by companies with a large presence in Canada. The engine is a General Electric sourced F-414. Its radar is made by Selex ES (which recently acquired an Ottawa-based Tactical Technologies. Saab itself is using the Bombardier airframes as the basis for its Swordfish MPA and GlobalEye platforms. While the odds may be against it, the Saab Gripen may be capable of causing an upset.